We may be in the grip of winter, with most of the heathland wildlife away in warmer climes or tucked up in hibernation, but it’s still a busy time for us. Only a month until our ‘season’ begins, which means we’re in the thick of recruiting the seasonal team. Our numbers will swell considerably from 1st March, when the year round team will be joined by six seasonal wardens. So watch this space for a new team photo! It won’t be long before the wildlife starts returning. Gradually the reptiles will come out of hibernation and the birds that have been away will be back before you know it. 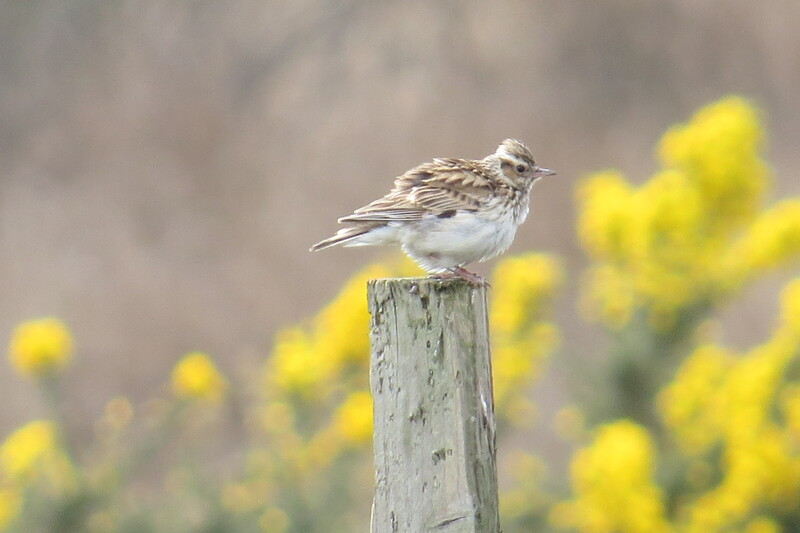 The first special bird to listen out for is the woodlark. They’ll be back on the heaths soon, to stake their claim on a territory, a place to bring up a family over spring and early summer. The male stakes his claim with song! Just like the blackbird that sings from the rooftops, he’s singing to attract a mate, but also to warn off other males. I love to hear the woodlark’s beautiful, fluting song, but sadly it’s becoming a rare treat, as woodlark numbers have dropped dramatically in recent years. We’d love to hear from you when you hear one on your travels. If you’re not sure what it sounds like, have a listen to the recording on the link below. Notice the distinctive phrases, flowing down the scale. Its Latin name is Lullula, a name I love because it reminds me of these lilting notes. Beautiful!